Re-posted with thanks, from Josh Del Sol at Take Back Your Power, who brought us the video documentary of that name on Smart Meters. 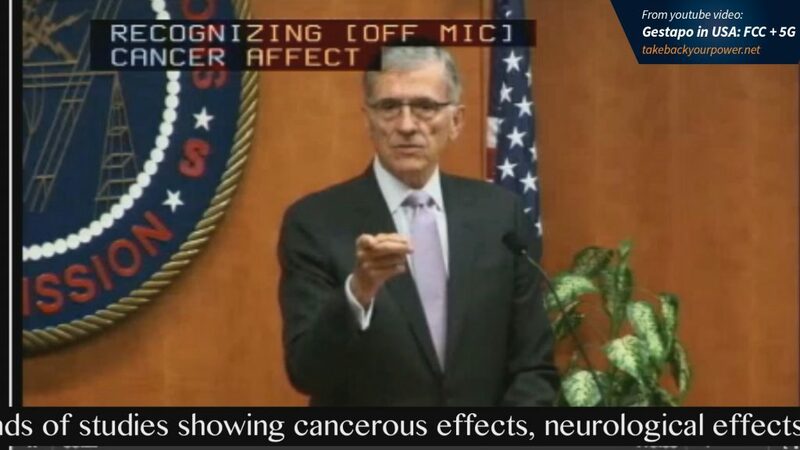 This is reportage on the recent FCC rollout of 5G, where reporters’ concerns about wireless harm to humans, including the dangers of cancer, were repressed openly at the meeting, as the enclosed video shows. 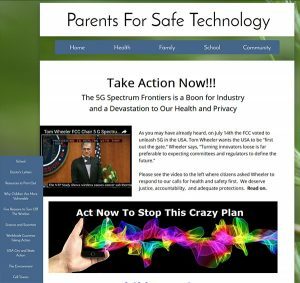 Please read the whole article with care, please watch the video, and please take personal action to contact Senators and Representatives to educate them toward stopping this rollout, as recommended below, because 5G is a blanket technology that will operate at ultra-high microwave frequencies, and, from all accounts, will most definitely cause infinite harm to humans, animals, and our environment. Children would be most at risk. One huge takeaway from this reportage and activism initiative is that it is time to let lawmakers know we are going to hold them personally accountable and liable for their actions in kowtowing to industry lobbyists and letting harmful legislation through, as Josh del Sol advises below, a realization that we could apply in all other activism as well. First, they prevented wireless science advocates from displaying a simple sign, violating their First Amendment rights in a public venue. Then, a security guard forcefully prevented a t-shirt from being taken out of a bag, by a former Congressional candidate with opposing views. Next, a Bloomberg reporter had his credentials confiscated — almost unbelievably — for merely talking with the former Congressional candidate. 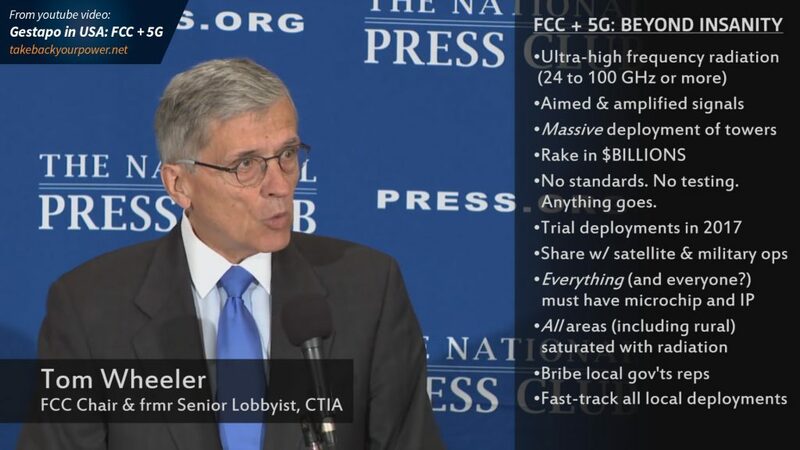 Following these incidents, the reporter, Todd Shields, was visibly irate with FCC Commissioner Tom Wheeler — who also happens to be the former president of CTIA, the wireless industry’s lobbying organization. And in the Q&A that followed, the former Congressional candidate Kevin Mottus successfully added another dose of truth the narrative. “Lydia, do you have a question? 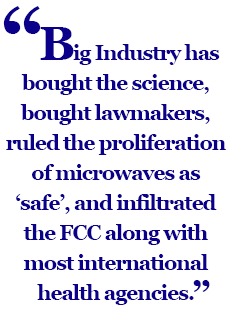 So, because there’s a lot of money in a wireless economy and the data-harvesting that comes with it — trillions, in fact — Big Industry has bought the science, bought lawmakers, ruled the proliferation of microwaves as “safe”, and infiltrated the FCC along with most international health agencies. And in the face of this willful, for-profit negligence, instead of employing conscience and responsibility, they’re actively silencing all opposition. You know, those of the human species that pay attention to passé concepts like science and reason. If unchecked, what could this lead to? The implications of all of this are very far-reaching. How far? Well, to find out, let’s start with what we know. It’s pretty clear at this point that we have a government that has been taken over by corporate interests. In order to increase their power and control even more, they plan to exponentially ramp-up the deployment of technology everywhere, which a vast body of science clearly says is harmful. If unchecked, this will almost certainly lead to an increase in cancer and other ailments associated with exposure to electromagnetic radiation. 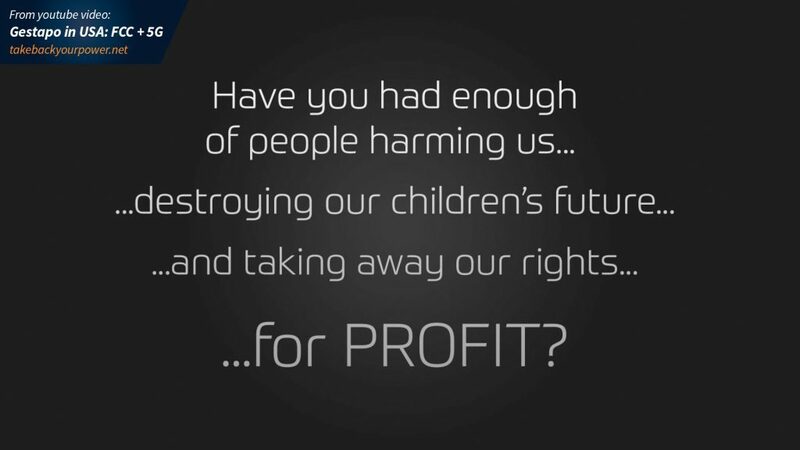 Haven’t we had enough of for-profit agendas putting profits before health? From a surveillance standpoint, we already know there is a sinister spying agenda operating behind the scenes. The rollout of “5G” technology — especially in the standardless, profit-centered way Wheeler describes — would indeed open up a considerable new threat to basic rights. If everything is connected, you can bet that as many details as possible about our actions will be tracked and stored somewhere — like the $2B NSA facility in Blufdale, Utah. And there is extraordinary market value in this. 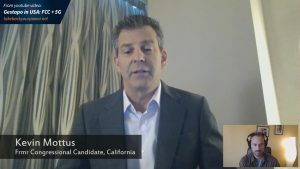 A director at NARUC stated that the value of data harvested just by “smart” utility meters will likely be worth a lot more than electricity itself, which is a $2.2 trillion market globally. But besides being creepy and making the 1% even richer, there are clear warning signs that a control-oriented governing system could easily take an indexed catalog of all of your actions and use it against you in a multitude of ways. For example, increasingly-instrusive “pre-crime” operations are already planned in Miami. And insurance providers are checking their customers’ facebook data to influence premiums and even coverage availability. So it’s really not unreasonable to see how a governing body concerned primarily with staying in power, could restrict rights or remove “privileges” for behavior that is deemed to be not aligned with national interests. So, tracking is not ok unless we are absolutely convinced that the governing body of that system truly respects individual rights and has the best interests of the people in mind. And right now, we are not even close to having such leadership in our governments. 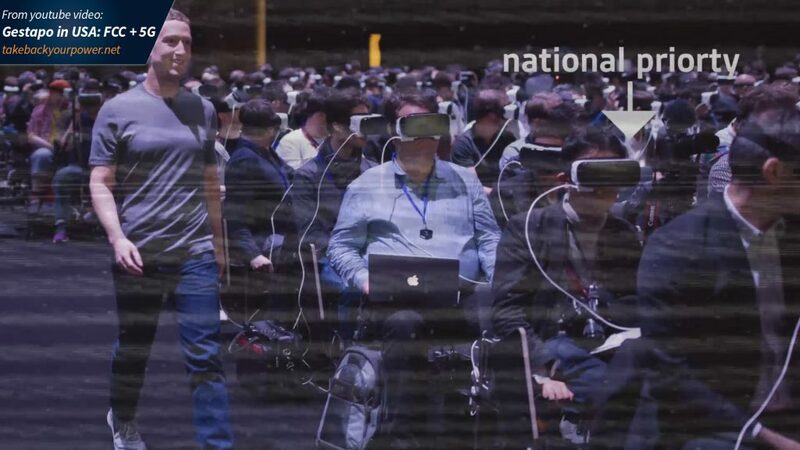 Wheeler’s vision of 5G would significantly enable those who are motivated by power and money to use technology to rule over everyone else. In order to protect our lives and future, we must not allow that to happen. While we would all like to have fast internet, we must now look closely at the downside of this technology, and take constructive action. This can understandably be difficult, due to the considerable attachment that we have to both our devices and the sense of immediate gratification that we obtain from using them. 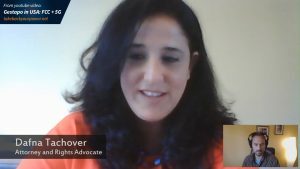 In addition to an interview with Kevin Mottus, last Sunday I skyped with Dafna Tachover, an Israel-based attorney who was present at “G-Day”, last Thursday. Tachover, who is among millions now who have directly experienced microwave radiation harm after becoming sensitized to it, says that the only way forward is individual accountability and liability. In my view, she is obviously right. Former Congressional candidate Kevin Mottus spoke about the urgency of the situation. What can I do to stop this crazy plan!? This is the “warning shot.” While all know more than letters to our reps will be needed to right the ship, this is where it starts. So do this first. 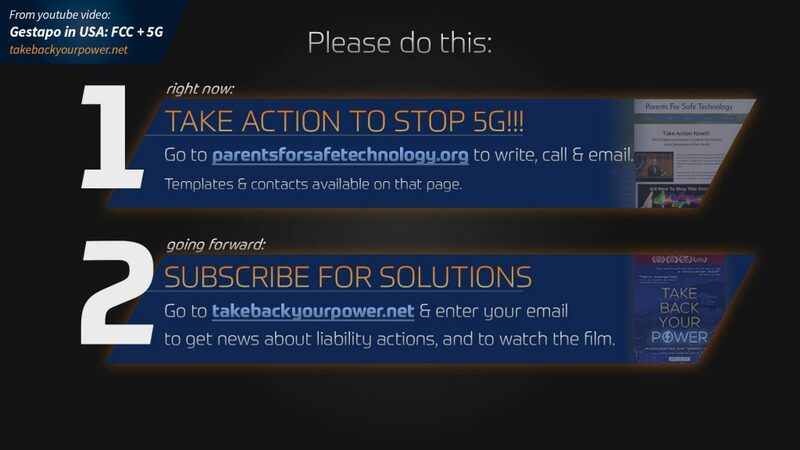 Then, to join the movement and be kept informed of organized actions going forward, be sure to subscribe your email to parentsforsafetechnology.org and to our site, takebackyourpower.net. 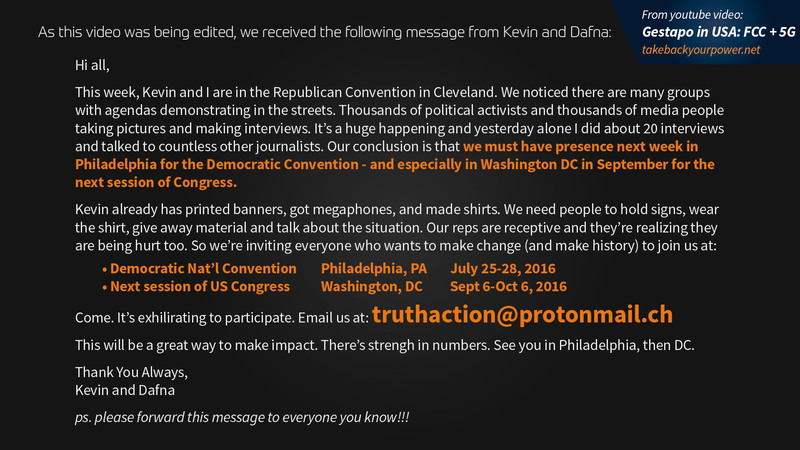 Mottus is calling on everyone to go to speak with your government reps in DC — and to go in person if at all possible. 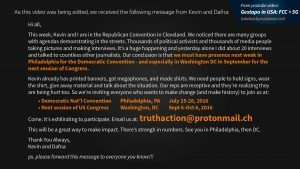 Mottus is inviting all anyone who wants to join him in DC for the next session of Congress (between September 6 to October 6), to email him at truthaction@protonmail.ch. It is also very important to contact your local governments, to let them know that they, too, will be held individually accountable and liable. In Wheeler’s June 20 talk, he very clearly identified the role that local governments will play, if their plan of 5G is to be “successful” or not. This is as much about standing up to the harm-doers and holding them accountable, as it is about holding yourself accountable to do the right thing. Not to take the world on your shoulders, but to do the right thing and stay connected with others who are likewise committed. In this process, we’re remembering who we are, as co-creators of reality. We’re accepting responsibility for the fact that we let the situation become what it is today, because of our passive trust in those who have become corrupted — but we’re forgiving ourselves, trusting in the greater flow, and coming together. Though it can be painful to face the situation and accept the necessity of our action, we just have to do it. We’re now seeing clearly that in order for the human species to make it through this threshold, individual rights must be protected. It is not ok to suppress free speech. It is not ok to suppress science; whenever this happens the resulting harm is enormous. And it is not ok to prioritize power and greed above life itself. So the only way left is to grow up, individually and as a species. 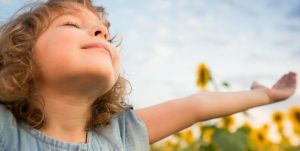 When we do this — by taking responsibility and putting our Inspired Will into the world — we open the door to a future of awakening, freedom and peace for all humanity. Repost of the article is ok with attribution and link back to this page. Josh del Sol is the director and producer of Take Back Your Power, a revelatory documentary feature film uncovering the worldwide ‘smart’ metering and grid agenda. Watch the film and subscribe to updates at www.takebackyourpower.net, and follow him via twitter @TBYPfilm. This entry was posted in Activism, cell tower radiation, Waking Up and tagged 5G, cancer, FCC, free speech, Gestapo repression, harm to humans from wireless, high frequency microwaves, Josh del Sol, lack of regulation, microwave radiation, Take Back Your Power. Bookmark the permalink. Romala, your response is very much appreciated, and i assure you, there will be much, much more to come. You will be amongst the first to know as i will contact you within the next week or so as i finish up on a few more projects and will make you a specific video (short documentary) introducing myself to you. You will then know there were some who absolutely knew, could clearly articulate and had undisputed evidence for a very, very long time putting together a large puzzle which lies right before our very eyes, yet most are still to blind to see. Yet, there is hope as more are awakening to the fact how utterly disfunctional our government and corrupt political systems of both parties are. They are awakening to how rigged the system is against the average American and the cancer, or elephant in the room in which we are dealing with in secret is part of the symptoms of a dying, dysfunctional corrupt empire which can no longer sustain itself. A true democracy or constitutional republic doesn’t conduct itself in the manner in which it has been operating in the shadows. It’s all connected, cause and effect, but we will connect the dots and get to that another time as i look forward to contacting you shortly. Thanks again Ramola, looking forward to contacting you soon. I may be reached at ecc@nym.hush.com. Thanks so much for your comment, and please email with more. Shall check out your videos, thanks, and absolutely, shared understanding and exposure is a great idea. Hi Romola, just checked back to site so i just got your reply. Thanks very much for comment, unfortunately it’s hard to get information out and i’m sure i don’t have to explain to you why that is. I’m the person awhile back let you know your YouTube site was being tampered with. I’m also subscribed to you on your YouTube channel, but you don’t seem to be to active there. I go by the name “Totalitarian TV” for my YouTube channel. I’m very aware of what’s going on and have vested interest and intimate knowledge of these programs and how they work. I think we also have a person in common by the name of Mona (Greenwalds attorney) , one of many who i’m working on in next few vids as it became personal. 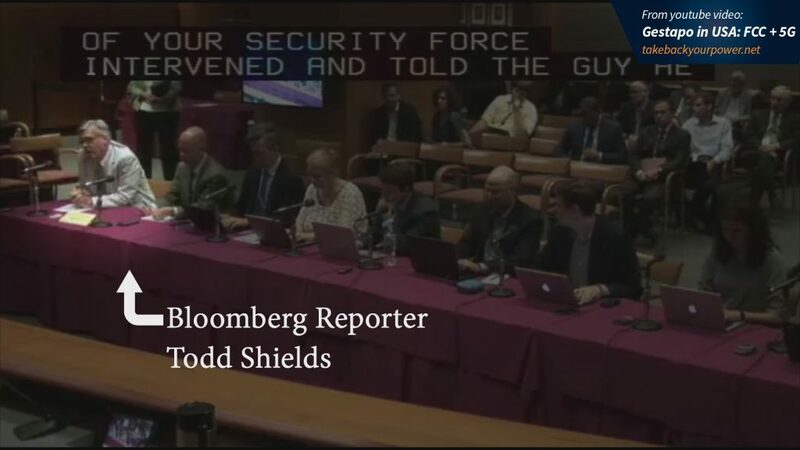 I also reposted this video on the latest article posted on site about NSA whistleblower being target from Florida. I’m also from Florida and know full well Pam Bondi and the governor Rick Scott are also involved in hiding these programs which also involve the use of “Stingray/Dirtboxes.” What is the best way to contact you as i can provide you real information which is needed and you see the type of “artistic” work being done on my end, but it’s only the beginning. Again, i know EXACTLY what is going on and can help put the pieces of a large puzzle together with hard evidence spanning a 10 year documented period. My channel has only 4 videos up now and website should be done soon. Here is another video if you’ve never seen and you should check out the others, but it’s all just a warm-up. Sorry for the long post, that’s why i wanted to know if there is other ways to contact you as i’m sure shared information will bring light to this insidious subject matter. I’ll check back for a response in a day or two. Thanks again for comment. Brilliant report on the intensified secret surveillance installed in our midst by the so-called “Strong Cities Network” propped up by secret law and secret interpretations of the Patriot Act, and deploying an overarching Smart Grid and Internet of Things electromagnetic infrastructure against Americans: thank you very much for posting. This video should be seen far and wide.